Now that your child has made progress with making sounds and imitating some of your speech, you can begin to encourage the use of actual words. I have some tips for helping the toddler develop speech. Eye contact with your child when you talk to him/her can go a long way in promoting speech. Eye contact indicates that you are paying attention to each other, and promotes focus on what you say. It also helps your child gain context clues from your facial expression and focus. Luckily, a child’s eyes don’t have to travel far from the eyes to the mouth, where he/she will learn about word formation. If you wear a bright color of lipstick, it will accentuate your mouth and emphasize how it moves as you speak. Certain words come easily to early speakers because they hear those words frequently, and can associate them with common objects and/or familiar faces. Repetition goes a long way in any form of learning, and speech is no exception. The more a child sees and hears a parent saying a word, the easier it becomes for the child to say the word, too. Need more convincing? Just think how songs and commercials stick in your mind after you hear them often. If your child seems reluctant to use words, don’t become discouraged. Resume your focus on imitating actions, such as waving, blowing kisses and banging objects together to make noise. This can take the form of play, of course. The more a child enjoys an activity, the more he/she will engage in it. As you play, imitate the child, and encourage child to mimic you. Take turns. As you play, promote words that imitate sounds: plop, boom, vroom, beep. Rely on repetition and consistency in how you offer the words. Consistency will reinforce the learning environment. A predictable routine will, too. When a child masters a sound, offer praise and encouragement. Celebrate all progress and success. Talk to your child the way you want your child to talk to you. Remember that you’ve promoted imitation, and your child will mimic your inflection and pronunciation. You may feel tempted to encourage and perpetuate baby talk, you don’t do your child any favors. Your child will take cues from you, so take care to set proper examples. Use maximum facial expressions, gestures and inflections. Should you tend to talk rapidly, try to maintain a slow and understandable pace. Narrate everything that you do, using a normal tone and correct pronouns. Don’t refer to yourself constantly as “Mommy” or “Daddy”, rather use a variety of appropriate pronouns. Don’t repeat those extremely cute mispronunciations either. It’s very tempting, but be strong. As your child develops, wait to catch his/her eye and narrate what he/she does. This helps put words in context with objects and actions. You’ll begin to notice the child holding up objects, tacitly asking you to say the name. Then will want to aim for you holding up objects and they say the name. When the child begins to form words, respond in a positive, celebratory and affirming manner. Don’t correct. Just respond, using the word correctly yourself. 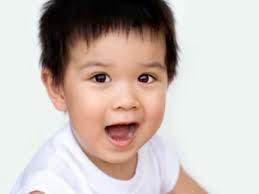 The more a child hears the correct pronunciation, the sooner he/she will adapt it. Affirm, praise and celebrate your child’s progress. Use words. Then your child will use words. But, again, remember that your child learns from your example. Set a good one.